As the lead economic development organization for Broome County, we understand the importance of creating new business opportunities to sustain and grow our local economy. 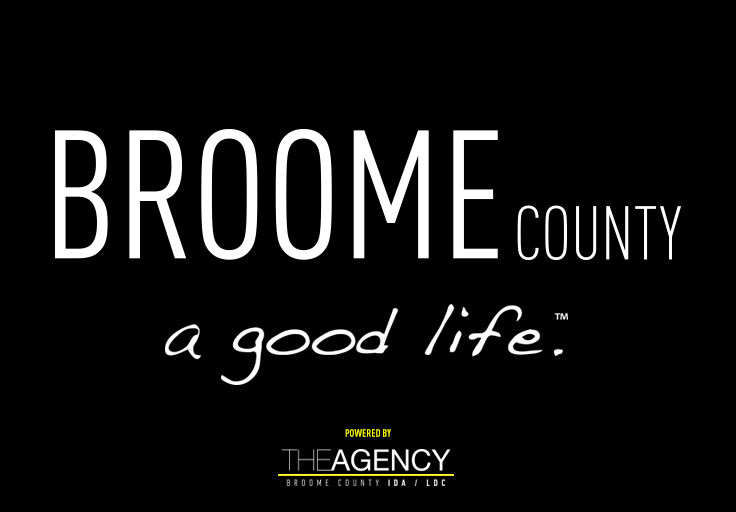 This does not only include the value of marketing Broome County as an idea location to do business, but as the ideal place to experience the perfect “work – life “ balance. But how do you craft a story in a way that captures a feeling? It’s not necessarily easy to do, especially when that story is about a place. But it’s exactly what we’ve attempted to do with the launch of our new economic development marketing initiative Broome County…a good life. This initiative is about more than promoting Broome County as a strategic location to do business. It’s about promoting what we all know and love about our community (and yes, we dare say love), which is a place where you can find a satisfying professional and personal life. Simply put, you can have a good life here. My staff and I, working with Hue Creative of Binghamton (formerly of Brooklyn), spent a year trying to define the story of Broome County in a single message. To do this, we asked ourselves a lot of questions. What is the feeling of Broome County? What is the experience? And then we realized, there isn’t one answer to this question. There are multiple. So we decided, rather than us tell the story, let’s hear it from the people building businesses, careers and lives in Broome County. From that, Broome County…a good life was born. This initiative will be the signature piece of our marketing efforts this year and into the future. There are multiple components to this initiative, all designed to tell the story of Broome County in a way that engages our local community and those outside looking in. We’ve launched a series of videos where local business owners and professionals tell their story about why they view Broome as a choice – not a consolation prize. I encourage you to check these out at www.broomeisgood.com. We’ve created a number of tools for local employers to use to help recruit and attract the best talent to our community. Giving the real first impression of all the Broome County has to offer. We plan to integrate our message in partnership with local organizations. Maybe you’ll find us at a Bearcats game or the Farmer’s Market? We’re also excited about partnerships with area schools to identify ways for students to tell the story of “the good life” they have here in our community. Lastly, we plan to utilize multiple media outlets to tell the story of Broome County. We’re thrilled to feature this first in a series of monthly columns in partnership with the Press & Sun Bulletin to celebrate the businesses and stories of those living a good life in Broome County. Look for new stories in the months ahead.